Baking soda for acne is one of the least expensive, easy to use, but effective treatment to get rid of acne and can be included in acne prevention regimen as well. Baking soda acne treatment is often successful, since it dries out pimples and removes excess oil from the skin. Adding it to your daily-use cleanser can provide an extra boost to due to its mild exfoliant and anti-inflammatory properties. Does Baking Soda Help In Acne Treatment? Let us find out – is baking soda good for acne? Many people support the belief that baking soda can help to remove acne and pimples. Although, this simple and inexpensive home remedy may not be as effective as some of the professional acne-treatments, but it still has many benefits for treating acne. (i) Baking soda is amphoteric that means; it can act as a base or acid. This property enables it to correct any pH imbalances on the skin. pH imbalances on the skin are a common cause for acne and pimples formation. (ii) Baking soda dries out the skin thus helpful in removing excess oil from the skin, which can otherwise cause blackheads formation and trigger acne breakouts. (iii) It has mild anti-inflammatory and antiseptic properties that help to reduce redness, swelling and irritation caused by inflamed acne. You can thus add some baking soda to your bath to soothe rashes, irritation or sunburn on your body. (iv) It has individual particles, which are rounded and hard. They form a fine powder thus making it a mild exfoliate. When mixed with water, it forms a fine, grainy paste that helps to clean and exfoliate the skin, getting rid of oil, dirt and dead skin cells. Caution: If you have sensitive skin, use baking soda with care. It can be very drying and in some cases can cause redness and irritation to the people having sensitive skin. Test-check the baking soda treatment on a small patch of skin behind your ear before applying all over your face. In case you experience any side effects, stop its use immediately. Even if you don’t have any side effect, you should not use it too frequently. As its use over time can upset the pH balance of the skin and may result into bacteria growth and more acne. Make sure to use baking soda not more than twice a week. And always moisturize afterwards! How To Use Baking Soda For Acne Treatment? (i) Take baking soda and water in equal parts and mix them well to form a smooth paste. Cleanse and pat dry your face thoroughly and apply the baking soda paste onto your pimples, cysts, acne, blackheads or scars. If any of your pimples are open, it may sting a little. (ii) Leave the spot treatment on for about 20 minutes at least and rinse it off. Leaving it on the pimples overnight can be over-drying, so exercise care to mix it with enough water to form a toner-like consistency. (iii) Moisturize your face with an oil-free light moisturizer after using baking soda. Tip: For extra spot treatment power, add a little freshly squeezed lemon juice to the baking soda and water for acne paste and you have one of the effective best overnight acne remedy. Use baking soda acne mask to get rid of acne and remove blackheads. (i) Take 2 tablespoons of baking soda and mix with 2 tablespoons of water. Add in a tea spoon of freshly squeezed lemon juice and stir well. If it has excess water, add some baking soda, but if it is dry add some water. Make sure the mixture is creamy and soft i.e. not too thick or too runny. (ii) Cleanse your face with a mild oil-free cleanser and pat dry your face. Apply a thin layer of the baking soda face mask for acne all over your face. It may sting a little (it’s a sign that it’s working), but if it stings too much take it off. (iii) Leave the pack on for about at least 15 minutes then rinse it off with cool water and pat dry with a soft, clean towel. Your skin will feel tight, dry and may look red afterwards. Apply a good oil-free moisturizer right away. This will make sure that pH is balanced, and required moisturizer is added to your skin. Tip: Apply this acne face pack twice a week until the pimples have disappeared. 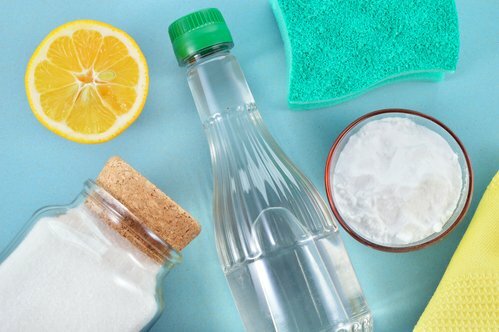 Baking soda as a cleanser is best for very oily skin. It can be irritating if you use it daily, but if your skin is very oily it should be able to handle it or you can use it twice or thrice a week. (i) Mix 2 tablespoons of baking soda with 2 tablespoons of water until you get a smooth paste. If you like, add a little freshly squeezed lemon juice. The citric acid of lemon juice will work as an exfoliator and helps to dry out acne and pimples. (ii) Wet your face a little with warm water and apply the paste to your affected skin area. Gently massage for at least 30 seconds using your fingers in small circular motions – avoid scrubbing too hard. (iii) Wash off the paste using water. Your face will look glowing and pink afterwards. Apply oil-free moisturizer of your choice straight away as otherwise this can be drying and may leave your skin feeling tight. Alternatively, a simple way is to just mix some baking soda with your favorite cleanser, preferably a gentle cleanser and see how magically it works. Are you suffering from acne on your back, chest or other parts of your body? Taking a bathe with baking soda can help you a lot. (i) Sprinkle 1/2 cup of baking soda into your warm bath water (don’t use any bubble bath) and mix well with your hands. (ii) Get into the tub and lay there for 15-20 minutes. Rinse yourself in the shower afterwards. The baking soda bath acne remedy will help to prevent acne breakouts. You can also have a sponge bath mixed with baking soda warm water to minimize blackheads on the back, chest and other acne-prone skin areas of your body. Mix 2-3 grams of baking soda to your bottle of shampoo to help reducing acne near the hairline on the forehead. Baking soda acne remedies are really effective acne treatments, try them it and see if they work right for your skin. You probably have some in your kitchen cabinet so go for it! Caution: Be careful while using baking soda acne treatment as it may cause irritations like burning and stinging. Thus test it first with your hands before using it. Baking soda is suitable for your daily use. However, if your skin is very sensitive, avoid using it regularly. If the dryness or peeling occurs, reduce application to every alternate day. Dint know the secrete power of Baking soda… amazin!! !